Q: What is private dance instruction? A: A private dance lesson is one-on-one learning with your dance instructor, done in a fun and relaxed environment specifically catered to your needs. A: No. You can learn any style of Ballroom or Latin Dance on your own. We will give you the proper lead and follow techniques so that you will always be ready to offer or accept an invitation to dance anywhere with anyone. A: Private lessons are 45 minutes each. Q: What is the frequency of lessons? A: Since you are starting, it is important to take at least 1 - 2 lessons per week. This will allow you to rapidly build upon what you have learned the previous lesson, making your progress much quicker. We will also show you how to practice at home effortlessly, building your confidence even more. A: Wear something comfortable to move in with shoes that have minimal traction. Ladies should wear a heel no higher that 2 1/2 inches for optimal balance. Q: Should I learn one dance, or many? A: It's okay to focus on a specific dance based on your immediate needs and goals (eg: wedding, special or formal occasion) However, to truly enjoy the benifits of dance, it's a good idea to focus on many styles. You will learn to understand certain types of movement in each dance, making it easier to learn moves in each dance. Q: What are some of the benifits of dancing? Q: What if I feel nervous and am afraid of looking ridiculous? A: The most important thing to remember, is that EVERYONE feels that way. We will work to your level giving you the important knowledge, fundamentals and techniques to make you a more elegant and confident dancer. Q: What is Wedding Dance? A: Wedding Dance, or Wedding First Dance refers to the first dance that Newlyweds dance together at their Wedding reception. A: Dancesport is a competitive or exhibition style of dance and is the most physically demanding and mentally challenging form of ballroom dancing. As in any sport, the requirements of fitness, discipline and training are the keys to ultimate success, yet the learning process is fun and the resultant skills can be used with confidence on any dance occasion. Q: Where do I go to Dance? A: Weddings, parties, fund-raisers, black-tie events, corporate functions, ballrooms, local dance studio social parties, cruise lines, night clubs etc. all providing you with invaluable practice on your styling, footwork and lead and follow skills, not to mention meeting new people and having a great time! 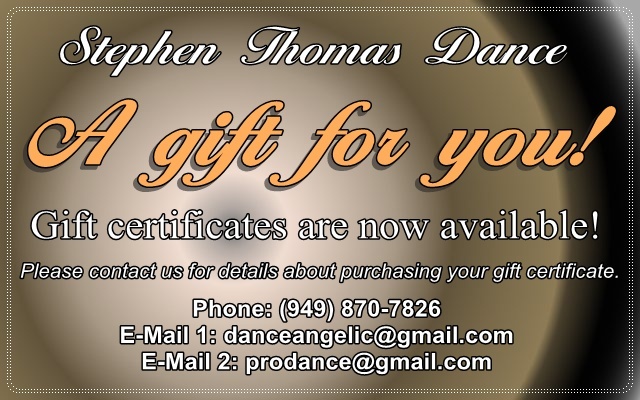 Visit our home page: https://www.stephenthomasdance.com/ to see all there is on offer in our world of dance. A: Please contact us to book a time for your first lesson. After your first lesson, you may decide whether you wish to continue on a lesson by lesson basis or on a 10 or 25 lesson program. You can enjoy the flexibility of paying lesson to lesson or enjoy greater savings by purchasing a lesson program. Q: Can you provide dancers for entertainment and perfomances at my special event? A: Yes, we are International quality performers and can dance for you at any special event, party or function. We regularly entertain guests at Weddings, Corporate Events, Parties and Shows. Please contact us for more information about performing at your event.